In this episode, King Drasil calculates the odds of his defeat as being “virtually zero.” So you're telling me there's a chance... YEAH! Digimon Data Squad is a very loud, defiant season. It's set on doing things its way, and rather than shy away from its differences to previous seasons, it puts them center stage, makes them do tricks and tells the haters to shove off. So it's perhaps surprising that the final episode follows the same mold as Adventure and Tamers. The good guys seize the momentum and destroy the final boss with tons of flourish, and their reward is a sorrowful goodbye to the Digimon partners that they've helped save the world. It's very familiar, and yet Data Squad comes through with its own spin. It leaves an ending that fits this season so immensely well that all but the most ardent of haters have to applaud it. What other season could get away with having a Rookie and his human partner delivering the finishing blow in tandem? Marcus and Agumon's trench run keeps the spotlight on them while allowing the rest of the Data Squad to do the heavy lifting keeping them alive. Their big finish features partner Digimon evolving on their own volition, independent of the DNA Charge or any other season's equivalent. It's a big deal as it's the first time the central Digimon stand on their own without human assistance. Every season is built on the idea that it takes a human connection to make a partner Digimon evolve. Whether it's as extravagant as the Bio-Merge or as routine as “Tokomon digivolve to Patamon,” that's why the kids are there, and that's why they take so much of the credit. Gaomon, Lalamon and Falcomon have become so dedicated to the effort that they don't need to be led anymore. They pop up to Champion, then Ultimate, then Mega on their own terms, with Thomas, Yoshi and Keenan just along for the ride. As for the sight of Marcus riding a giant Agumon through King Drasil's armor, Spencer's arbitrary revival and Marcus's final decision, all of those are totally crazy and shouldn't work the way they do. But in this season, why not? So we have the prayers of humanity engineering a way for Agumon to get stronger while keeping Marcus in the fight, and King Drasil just declaring that Spencer is too great a man to be left dead. For a show where finales are usually sad, Spencer's revival is a happy reunion that may not make sense, but is certainly deserved and appreciated. Yes, Marcus's decision to return to the Digital World goes against the reason for closing the gate in the first place, but it's the only logical place for his character. Just as it was for the Digimon, who make the mature decision to return themselves. They recognize that despite the agonizing separation from their partners, they no longer have a function in the human world and can only do harm. Thomas and Yoshi understand and part on happy terms, while Falcomon convinces Keenan to give his birth world and birth family a try. Marcus, having tried both, is intent on doing the opposite. Like Agumon, he's a fighter, and like the Digimon he realizes that he would do more good enforcing a Digital World suddenly plunged into anarchy. The epilogue doesn't add much, but at the same time doesn't tear up the place the way Zero Two's did. It falls on the other side of my prior criticism of the time jump epilogue- everything's about as you'd expect it and nothing's all that interesting. But after such a crazy chain of events, normality is reassuring. DATS no longer needs to exist, Keenan has a new and society-conforming outfit, Thomas is using his incredible mind for human advancement, and Marcus has found his niche. The king is dead- all's right with the world! While “humanity standing for survival” seems to work by strengthening Marcus and Agumon, it appears to do more to rattle King Drasil. The notion that everybody is throwing their support against him despite the overwhelming odds in his favor is so illogical that he has trouble accepting that it's really happening. For someone used to unconditional piety, that's gotta be tough to take. Getting DNA Charges from Kristy, Sarah and the rest of DATS was obvious. Keenan's baby sister was fun. What really made the scene work was featuring characters that we've all forgotten about like that boxer and his family. Previous antagonists like Neon and Nanami reinforce the point that despite the fact that things occasionally get testy and violent, that doesn't make existence useless. Marcus's skepticism when he sees his father is heartbreaking. Somebody who takes everything at either face value or fist value, and he can't even be sure his father is really him. 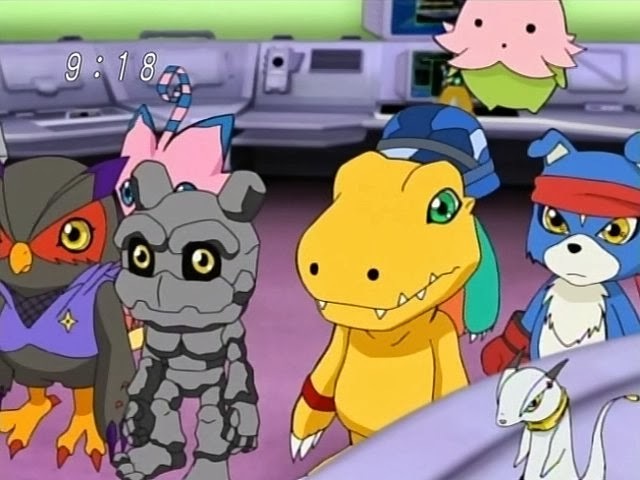 Marcus and Agumon having another fist fight in the same place as their episode one brawl was a nice bookend to the series. Instead of Agumon insisting on his right to be in the human world, it's now him insisting that he needs to leave it. Between Data Squad and Adventure, the two seasons allowing drawn-out goodbyes, Yoshi and Lalamon end up with one of the best. Lalamon reconciles their departure by explaining that Yoshi's grown to the point where she doesn't need her anymore. Given how much grief Lalamon gives Yoshi, it's no wonder Yoshi's so happy to hear that. As if she finally feels like Lalamon accepts her as an adult. Runner-up: Miki and Megumi saying goodbye to their PawnChessmon by treating them to karaoke. I hear the white one does a mean Sweet Caroline. Considering Gotsumon once tried to kill Yushima, it was awfully nice of Yushima to let Gotsumon in on his and Kamemon's milkshake bender. There's nothing as shocking as Astronaut Matt in this epilogue, but post-puberty Keenan's voice might be more jarring than future Tai's haircut. Data Squad was really satisfying, because it was so damn confident. Both Data Squad and your reviews were awesome. Not sure if Fusion will engage me quite as much, but I'll be along for the ride! You know, I found this ending opposite to you. Rather than satisfying and fitting, to me it seemed to be rushed and done for conformity to the other series. 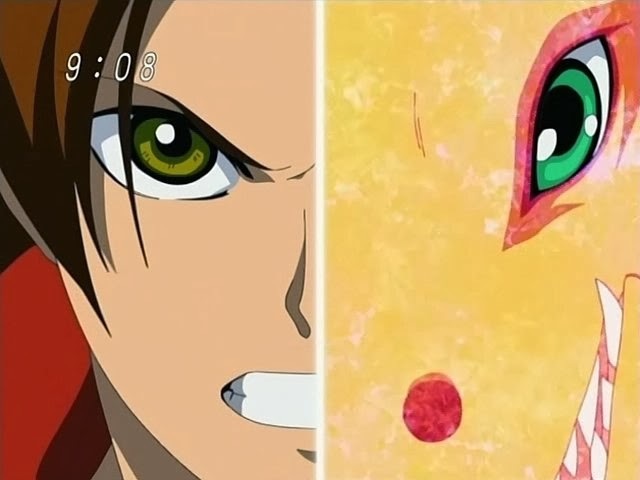 Throughout the show, the heroes have argued "Digimon and humans can live together in peace", and now the Digimon must leave and never return because they can only do harm, proving the villains' point that Digimon and humans cannot live together in peace. "DATS no longer needs to exist"
Actually DATS seemed to have reconfigured itself into a police force, which is where Sampson, Yoshi, Miki and Megumi all end up working. Frankly, this is my most disliked season. Not satisfying in the slightest. Too much wasted material and characters (Yoshino). Plus Masaru is so damn unlikable for a lead. And the whole punching Digimon gimmick was just cringeworthy.